Another emergency fix for the 3.15.x branch to deal with log spam slowing down world generation. Commented out debug code from flower generation that was causing lag due to log spam. I’ve been working on finally getting the EbXL 3.15 branch ready to be re-synced with github again so that we can finally have other people able to contribute to out code again, along with doing some minor tasks on the build for 1.7, mainly focusing on code that we can bring back to MC 1.6 stuff such as localization in tool tips. It is almost ready to be re-synced again and we just need to make sure that everything matches on up and then we will be good to go and other’s can once more push bug fixes if they are needed. So in starting in EbXL 3.15.x we started adding tool tip flavor text to things like flowers and other such things. There were two minor issues with it, firstly for longer flavor text/descriptions each line of the text had to be manually separated, and hard coded into the mod itself. With the work that we have been doing in 1.7 that will no longer be an issue, as we will be able to simple enough back port the update to allow for wrapping formatted text in tool tips. As you can see by this example I have also been working on getting the mod config screen up and running, and although it is nowhere near complete, it is progressing nicely. Unlike the video settings screen in 1.7, the buttons on our config screen actually make the clicking sound when you use them and also have can tool tips to better describe what they do. Also the code that for adding new properties has been simplified a bit more and now only needs the property to be defined, as the button text and the tool tip are now localized. 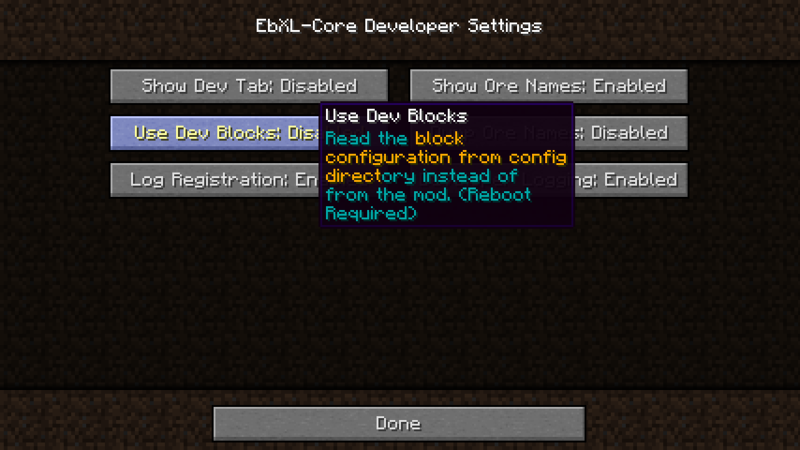 Due to the server not having access to the resource packs and thus localization the actual config file will not be able to be localized as I understand it, but you could easily enough edit the configuration on a client and then copy the config on over to a server/mod pack.